LISBON, Dec. 3 (Xinhua) -- The upcoming state visit by Chinese President Xi Jinping to Portugal is historic and a milestone in the development of China-Portugal relations, which will open a new chapter for bilateral ties, said Chinese Ambassador to Portugal Cai Run. It will be the first state visit by a Chinese head of state to Portugal in eight years and also the first visit to Portugal since Xi took office as Chinese president, Cai said in an interview with Xinhua. The friendship between China and Portugal has a long history with more than 500 years of exchanges, Cai said. The ancient Maritime Silk Road linked the people of China and Portugal closely, which helped them understand each other and deepen friendship, the Chinese envoy said. 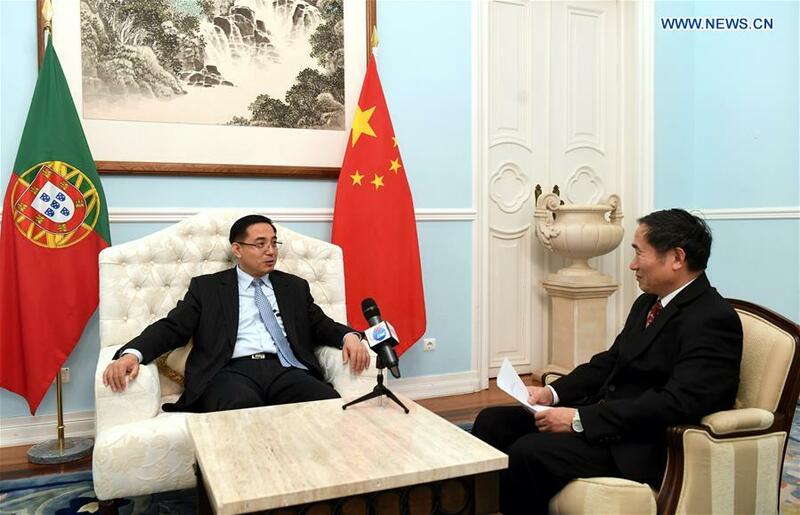 Since the establishment of diplomatic relations in 1979, the friendly exchanges and cooperation between the two countries in various fields have maintained a steady and healthy development, he said. Sino-Portuguese relations are at their best in history, he said, adding that high-level exchanges between the two countries have been frequent and mutual political trust has deepened continuously. In recent years, China-Portugal economic and trade cooperation has continued to deepen and achieved fruitful results. China is Portugal's largest trading partner in Asia, while Portugal is one of the main destinations for Chinese investment within the European Union (EU). Chinese and Portuguese companies have joined hands to develop markets in Portuguese-speaking countries, as well as in Europe and America, Cai said, adding there are great potential and broad prospect for them to further cooperation in third-party markets. Bilateral trade value between China and Portugal reached about 5.6 billion U.S. dollars in 2017. Preliminary figures show that China's investment in Portugal has exceeded 9 billion euros (about 10.2 billion U.S. dollars), involving sectors such as energy, electricity, banking, insurance and health care. Portugal's investment in China is also growing steadily. At present, the Portuguese government is actively preparing for the issuance of renminbi-denominated bonds in China. Portugal is expected to become the first euro zone country to issue such bonds. Cultural exchange and education cooperation between China and Portugal have also been flourishing. More than 250,000 Chinese tourists visited Portugal last year, an increase of over 40 percent year-on-year. At the same time, the Portuguese people's interest in Chinese and Chinese culture has become increasingly stronger. The number of Portuguese tourists visiting China so far this year has increased by 16 percent compared with the same period last year. The number of students studying Chinese in Portugal has increased year by year, while the number of Chinese students studying in Portugal is also on the rise, according to Cai. The pragmatic cooperation between China and Portugal is in full swing and is becoming a model for countries that seek mutually beneficial and win-win cooperation in bilateral ties, Cai said. The cooperation between China and Portugal under the framework of the Belt and Road Initiative (BRI) has continuously made new progress, he said. Portugal is an important partner in the construction of BRI and one of the founding members of the Asian Infrastructure Investment Bank. Both Portuguese President Marcelo Rebelo de Sousa and Prime Minister Antonio Costa made it clear that Portugal supports the BRI and hopes that China and Portugal could expand pragmatic cooperation in various fields under the BRI framework, Cai said. Portugal is an important member of the EU and the Community of Portuguese Language Countries. It has always played a positive role in promoting China-EU relations and the relations between China and Portuguese-speaking countries, Cai said. The Chinese ambassador believes that President Xi's state visit to Portugal will certainly inject new impetus to the development of China-EU relations and will expand new space for the cooperations under BRI. "Bosom friends make distance disappear," Cai said, quoting a Chinese poem. He said that even though China and Portugal are located far apart, the two peoples love peace, hold dear friendship, value family, and share many common pursuits. To strengthen China-Portugal relations on a friendly and mutually beneficial basis is the common aspiration of the two peoples, Cai said.